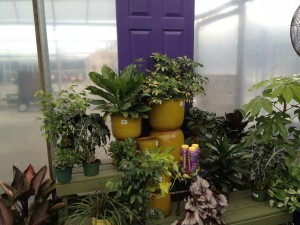 When I visited the Pike Nurseries garden center this weekend in Peachtree City, GA, I was looking for a few new houseplants to bring home, to tide me through the dreary winter days. But here’s what I found instead: 3 displays of brightly-painted doors, arranged with color-coordinated plants. I’ve been fascinated by doors for some time now. (Is anybody else pinning beautiful doors they’ve found on Pinterest? Love that site.) These appealed to me, in these shades of purple, lime green, and soft blue. Admittedly, the plants in the display look like houseplants, and they wouldn’t survive outside in the Atlanta area, since our temps can drop below freezing during the winter. 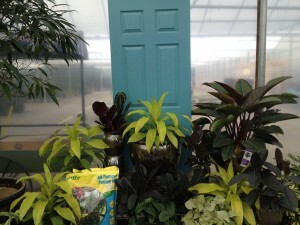 But I like the concept of matching plants to an eye-catching door color, and I can envision using tropicals, perennials, and even annuals, in containers and beds at the front of my house, once spring returns. I also plant to re-paint our door when better weather arrives. Right now, it matches our shutters, which are medium blue. Not bad, but the door could be a lot livelier. Maybe I can find a warm, deep red. If we don’t like it, it wouldn’t be much trouble to repaint it, even after one season. If you decide to experiment with your front door this spring, here’s a great video with DIY guy Carter Oosterhouse: GMC Trade Secrets: How to Paint Your Front Door. I’m going to try his tip about photographing my house, cutting the front door out of the photo, and then sliding different paint chips behind the opening, to see how various colors would work. 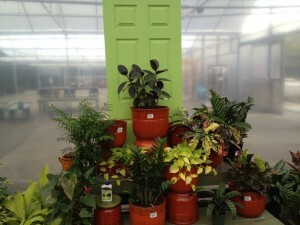 Got a picture of your front door you’d like to share? I’d love to see it here. I’m always looking for inspiration for the garden! The colors on those doors are great! We could actually use some paint on ours, so thanks for the link to the video! I’m going to repaint mine, too, when the weather warms up. Saw a pic online of a door painted a nice red for the Christmas thru Valentine’s Day period, and the homeowner dressed it up with artificlal flowers in coordinating colors. Then she repainted for spring and summer. 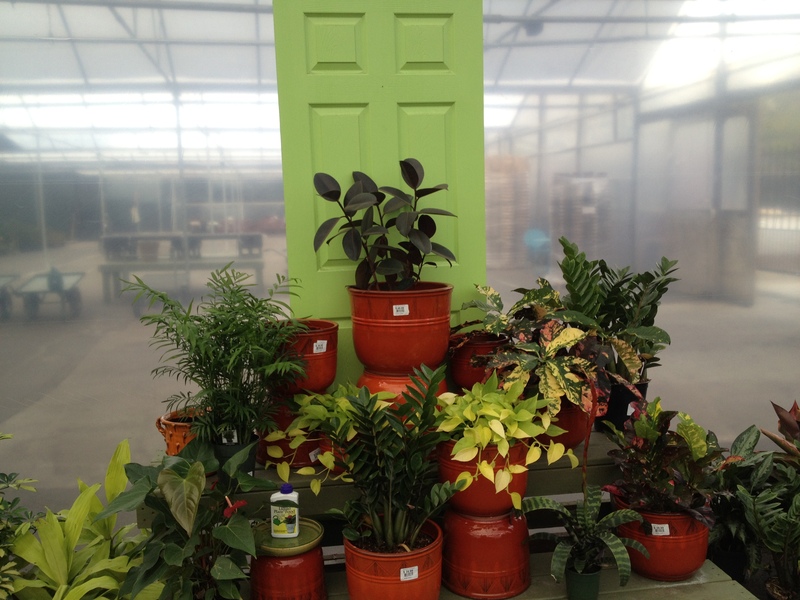 I’d never thought about that, but thought it was a fun idea, and a door doesn’t take that long to paint!